SALT LAKE CITY – Fossils of a previously undiscovered species of dinosaur have been found in slabs of Utah sandstone that were so hard that explosives had to be used to free some of the remains, scientists said Tuesday. The bones found at Dinosaur National Monument belonged to a type of sauropod — long-necked plant-eaters that were said to be the largest animal ever to roam land. 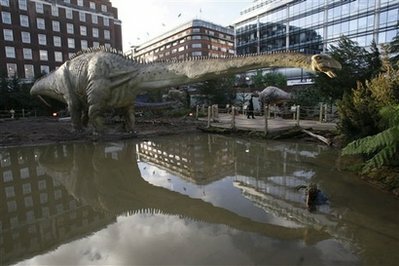 The discovery included two complete skulls from other types of sauropods — an extremely rare find, scientists said. “You can hardly overstate the significance of these fossils,” he said. Of the 120 or so known species of sauropods, complete skulls have been found for just eight. That’s mostly because their skulls were made of thin, fragile bones bound by soft tissue that were easily destroyed after death. “This is absolutely No. 1 in terms of projects I’ve had the opportunity to work on,” said Brooks Britt, a Brigham Young University paleontologist who co-authored a study on the fossils along with University of Michigan researchers. The new species is called Abydosaurus mcintoshi. Researchers say it’s part of the larger brachiosaurus family, hulking four-legged vegetarians that include sauropods. The bones came from a quarry known as DNM 16. It was discovered in 1977, but intensive excavations didn’t get started until the late 1990s. The skulls were found in 2005. Tantalized researchers, though, were stymied by rocks around the bones that were so hard that workers were unable to break through, even with use of a jackhammers and concrete saws. Last year, a blasting crew from Rocky Mountain National Park in Colorado spent three days at the quarry detonating handset explosives that loosened the rock but didn’t damage the bones. That allowed scientists to pluck out other fossils, including leg bones, shoulder blades and other parts. “We don’t know how much bigger they could get,” Britt said. 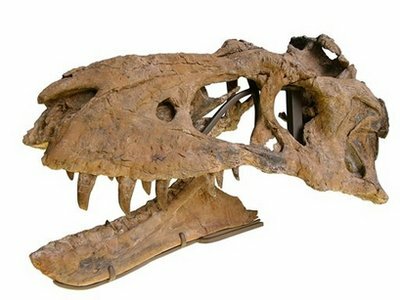 The skulls — including one that’s complete and intact and another that’s complete but in pieces — offer new clues about how sauropods ate their food. “They didn’t chew it. They just grabbed it and swallowed it,” Britt said. Early sauropods had wide teeth. Later versions had narrow, pencil-like teeth. The abydosaurus teeth are in-between, which will help scientists trace how their eating techniques and diet evolved. “Abydosaurus is the right dinosaur at the right time to answer some of these questions,” University of Michigan researcher John Whitlock said in a statement. The find may offer the most complete view yet of certain sauropods roaming North America from the Lower Cretaceous period spanning roughly 145 million to 99 million years ago, said Jim Kirkland, Utah’s state paleontologist, who was not involved in the discovery announced Tuesday. The fossils are on temporary display at BYU’s Museum of Paleontology. I go to see day-to-day a few web pages and websites to read articles, except this weblog offers feature based posts.